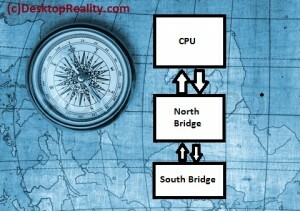 Why North and South Bridges ? Every student who goes through the IT infrastructure study will surly go though the theory of North and South bridge chips on the motherboard . 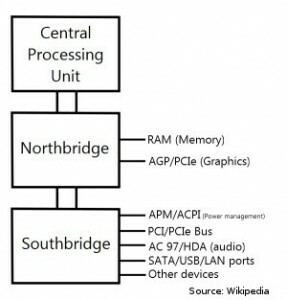 ever thought why theMemory Controller Hub and IO controller hub are named so ? But our point of discussion is why the north bridge is called so ?. The reason behind the name is simple . If you just think the above image as a good old map and place a compass on top of it , you know that the north will be on the top . 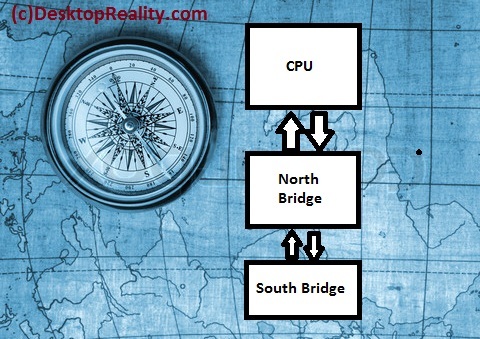 So the first and faster MCH is called north bridge because that bridge is on top of the map just below the CPU and the south bridge is on the bottom of the map . പക്ഷെ AMD അവരുടെ Athlon series തൊട്ടും Intel ‘Core i’ series തൊട്ടും integrated memory controller (IMC) ആണ് ഉപയോഗിക്കുന്നത്. അതായതു Memory Controller, സെന്‍ട്രല്‍ പ്രോസസ്സിംഗ് യുനിറ്റില്‌(CPU) തന്നെ ഉള്പെടുത്തിയിരിക്കുന്നു. അപ്പോള്‍ Northbridge, PCI/AGP നിയന്ത്രണത്തിന് മാത്രമായി. ഇപ്പോഴത്തെ പുതിയ മതര്ബോര്‍ഡുകള്‍ എല്ലാം Northbridge ഒഴിവാക്കി ആണ് വരുന്നത്. Northbridge era ഏതാണ്ട് അവസാനിച്ചു.